Trade magazine for travel agents. 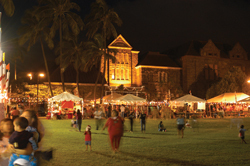 After hours, Bishop Museum comes to life. It’s a typical evening at Moonlight Mele, the Bishop Museum’s annual summer concert series. The crowd is sprawled down a slope of lawn, staking out territory with blankets, woven mats and low beach chairs. There’s a festive atmosphere as they share teriyaki beef and Longboard Ale purchased from the vendors around the perimeter. But when Hawaiian musician John Cruz begins to strum the opening chords of his theme song, a calm comes over the crowd and they quietly sing along. For the growing number of clients who seek an authentic experience during their visit to Hawaii, Moonlight Mele is an excellent opportunity to experience the local lifestyle. In fact, despite its focus on the past, the Bishop Museum provides a surprisingly valuable window on contemporary Hawaiian culture, especially after hours. In the daylight, of course, the Honolulu-based museum is one of the state’s most important visitor attractions. But its nighttime activities — cultural lectures, films and special events — are decidedly local. Collectively, they give travel agents unexpected opportunities to tailor their clients’ trips to their particular interests, while helping their clients mingle with likeminded residents. Bishop Museum has dubbed 2008 The Year of the Hula, so as part of its Traditions of the Pacific series, it’s running a series of fascinating seldom-seen films that celebrate the role of hula in Hawaiian culture. During informal seminars and presentations, Traditions of the Pacific also encourages clients to hobnob with cultural practitioners and learn about the essence of Hawaii. Since the museum is one of the world’s premier natural history institutions, clients of a more scientific bent can attend fascinating public lectures given by informed scholars. Sometimes, the lectures tie into current exhibits; for instance, the upcoming Whale Talks correspond to the Whales-Wonders of the World exhibit that runs through Sept. 21. Other lectures look at subjects like the coral reefs of Hawaii and the world’s largest sharks. For clients traveling with children, the Bishop Museum offers a variety of family-focused events that are an important part of living in Hawaii. Take Treat Street, an elaborate celebration of Halloween that has become a local tradition. Family Sunday, an event that precedes the opening of any major exhibit, is a festival of local food and entertainment as well as an opportunity to preview exhibits. But it’s the Moonlight Mele concerts that offer clients their easiest access to local culture. Inevitably, they come away with the same mix of nostalgia and conviviality that, for years, has drawn islanders to a night at the Bishop Museum. The old Hawaiian lady smiled wistfully as Mr. Young tonged her order of wet li hing mango out of a massive jar. When he put them on the scale, the scarlet slices glistened in the afternoon light. It’s a sentiment echoed by customers a thousand times a day in the old store. But, if a visit to this Oahu institution, known simply as the Crack Seed Store, is a dose of nostalgia for locals, for visitors it’s a charming glimpse into the real Hawaii. Crack seed, fruit preserved in a concoction of sugar, salt, licorice, star anise and li hing, a tart red powder made from the pits of plums, was brought to Hawaii by Chinese immigrants more than 100 years ago. Ancient Chinese warriors are said to have carried crack seed under the saddle of their horses. But despite its immigrant past, the crack seed store is thoroughly Hawaiian. Pre-packaged crack seed can be found in almost any supermarket on Oahu, but if clients are eager for an authentic crack seed experience, encourage them to visit Mr. Young’s pleasantly grubby shop in the old neighborhood of Kaimuki. Inside, hundreds of great apothecary jars line the shelves, each filled with a different variety of crack seed: rock salt plum, candied ginger, li hing mango, sweet sour lemon. The atmosphere is like an old-fashioned candy store, a place where grandparents and children both feel at home. When your clients are ready to order, Mr. Young shuffles out from behind his battered counter and scoops the sticky morsels into little plastic bags. The sheer number of options can be daunting, and even old hands often walk out with four or five varieties. A more modern version of the crack seed store can be found among the luxury outlets at Honolulu’s Ala Moana Shopping Center. The Crack Seed Center is a bright, clean shop with an enormous selection of traditional fruits, crackers and dried seafood. Its central location makes it tremendously popular with locals, and a squadron of young women in red smocks are quick to offer their help.